Finally, after what seems like forever, Young Adult is out on DVD. Being a HUGE Jason Reitman fan, I'm hoping for some big things. Also, I'm checking out The Descendants again. Just so I can check that my Melbourne judgement was right. I wasn't originally going to watch it again since The Darkest Hour was supposed to come out, but that got delayed. So The Descendants it is. I can't stop watching The Great Gatsby's trailer. Oh, I love Baz Luhrmann. I love that book. I love Leonardo DiCaprio. I love Jay Gatsby. I'm part of the 0.02% of film bloggers who thinks this will be awesome. I'll be absent from the blogging world this weekend. Since it is Queen's Birthday, me and seven of my friends are going to the beach. Then it'll be study leave for a week, so I'll have more time to blog! (but probably not any more inspiration). Diana reviews the fantastic yet extremely painful to watch The Diving Bell and the Butterfly. Tyler looks at the brilliant score for The Girl with the Dragon Tattoo. Since seeing the movie again, it's been interesting to put the songs to the scenes and getting a totally different meaning to them...if that makes sense. Rodney looks at film piracy in his midweek mumble over at Front Room Cinema. One movie that I've always wanted to see is the star-studded 1933 classic Dinner at Eight. Anna gives it a favourable review. Sati takes a look at rising star Rooney Mara - a.k.a one of the most beautiful women ever, in my opinion. Anomalous Material has awesome new images from Django Unchained. Come on, Christmas! The Void has ended his Cannes Marathon, and has summed everything up nicely here. Andy looks at him favourite fleeting moments from David Fincher's The Girl with the Dragon Tattoo. This movie was so awesome. Ruth has taken part in a blogathon all about horses in film. Because horses are awesome. The LAMMY nominations have closed and we'll see who's lucky enough to be in the running this year in a couple of days. Meanwhile, here's a tournament for the best FYC posters! Favourite film score/soundtrack of all time? Thanks for the linkage, and enjoy your holiday weekend! I was hoping to get away as well but I think we'll just stay at home and watch films. I think my sister's having a barbecue so we might go to that on Sunday night. As for my favourite movie score, that'd have to be Three Colours: Blue. Fantastic music in that movie, utterly flooring. Thanks...I hope you do too! I need to watch the Three Colours trilogy again. I'll do that during study leave. And then I'll probably buy the score. You're welcome - it was a very good piece! Thanks for the linkage, as always, you are a sweetheart! Have fun next week at the beach! I am very intrigued by the Great Gatsby trailer, looks crazy fun, I wasn't expecting it to be so wacky, and now I get why Baz wanted to use 3D! You're welcome, and thank you! I suppose you'll have Queen's Birthday where you are, so have a good long weekend! It does look like crazy fun. I'm sure Baz will make good use of the 3D! I want to see Young Adult so much! I believe in Cody, Reiman and Theron. I'm also in that 0.02% of film bloggers. The question is both hard and easy. Inception score by Hans. Duh. Young Adult is actually really good! I really liked it. I love the Inception score. 528491 and Time are my favourite songs ever. Thanks for the linkage! 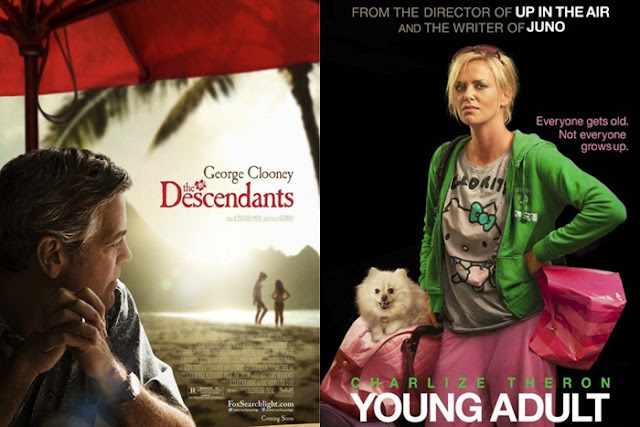 I was actually really surprised by The Descendants. Well, more so Clooney in it. As I said in my review, I originally only thought of him as a modern day Cary Grant (charming, suave, etc.). But like Grant, he can do wonders when in the hands of the right director. True, George Clooney is a little different than he usually is. He's not the suave guy I'm used to. Thank you for the link! I hope you'll like Young Adult, it's one of my favorites from last year. I really did like Young Adult. What a fantastic movie! Oh favourite score- probably The Hours since it affects me almost as much as the movie. For soundtracks, I love the classic ones like The Graduate and Garden State etc, but my absolute favourites that I love equally are those of Nick and Norah's Infinite Playlist and Marie Antoinette. I got into so many bands after them and I love the songs!! I need to see The Hours again. I really like that movie. Nick and Norah's Infinite Playlist has so many cool songs in it! Love that movie. I far more enjoyed the Descendants. I feel that Young Adult is one of those movies that while I thought was interesting and well acted, I never need to see it again. I hope you enjoyed what you saw though. Yeah, I don't know if I'll ever watch Young Adult again. I really liked it, though! Thanks for the link and despite the Jay Z/Kanye track, I do like that trailer for The Great Gatsby. I just hope it's an improvement over Australia which I found to be at times, overlong and also over-dramatic in some parts. Plus, the story was kind of weak to be an epic. Australia was a bit OTT indeed, but I still kinda liked it. The Great Gatsby does look like an improvement! Favorite film scores are Cinema Paradiso, The 400 Blows, and The Social Network. The Social Network has an amazing score! Thank you for the link Stevee. I enjoyed working on that post. Glad you liked Young Adult too. Just came out on DVD here. I'd like to watch it again. That post was awesome. And yeah, Young Adult was pretty darn good! Haha, I did it tonight :) Thanks for the idea!